It was a sunny morning the summer after my sophomore year; I woke up with the “first day jitters” because it was the first day of my first internship ever. I was nervous, excited, but most of all ready to gain actual experience at a company related to my field of study. As I got up and started putting on my “business casual” outfit, set out the night before, the mix of nerves and excitement intensified. Fast forward a couple hours: I am sitting in a conference room waiting for the rest of the interns to trickle in for the start of our orientation. Everyone seems friendly enough, but as the HR manager begins the introductions, I look around the room and can’t help noticing that of the 15 interns in the room, I am the only woman. Unfortunately, this is an experience that is all too common for women in engineering, such as myself. The statistics are startling: women are awarded only 19.3% of Bachelor’s degrees in engineering, and the percentage is disturbingly lower for minority women, only 3.1%. 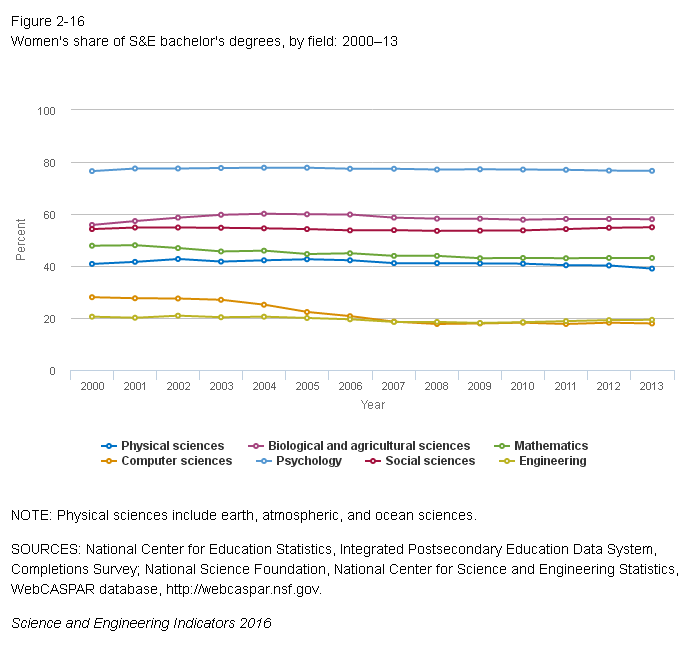 The total percentage of women in engineering drops further after obtaining Bachelor’s degrees. Only 15% of the entire engineering workforce is made up of women. My particular major, environmental engineering, is better proportioned than most engineering majors, but we still barely make up a third (33.8%) of all environmental engineers (https://nsf.gov/statistics/2016/nsb20161/#/figures). I had heard the statistics before, but it still threw me off a little bit truly experiencing it for the first time. Everyone was super nice and I never had an issue, but I still found myself feeling self-conscious regardless. I ended up having a great internship and returned to the same company the next summer (roughly one third of the interns were women that second summer). Take risks, and don’t be afraid to fail. College is where you learn and grow. Don’t be afraid to try something new or fail. It’s okay as long as you keep pushing towards your goals. Be aware of the “chilly” climate, and don’t forget your ‘sweater’. Negative stereotypes and under-representation of women in STEM contribute to negative environments. Within white, male-dominated industries, negative gender and/or race-based experiences, such as sexual harassment and racial microaggressions, are more likely to occur (Ong, 2005, Antecol & Cobb-Clark, 2001; Willness, Steel, & Lee, 2007). Women may report as feeling like an “outsider” and, as a result, experience feelings of social isolation. All of these factors and more contribute to the “chilly” climate for women in STEM. In order to resist, combat, and overcome this environment, it is important to have your SWEATER handy. S = Squad – Find your people and create a supportive network of like-minded folk who you can rely on to motivate and empower you. W = Wellness – Self-care is important for everyone, but particularly important for people who may experienced heightened stress related to their social identities. It is important to have a plan in place to positively manage stress. Make a plan and execute it daily – not just when you’re feeling stressed. E = Expertise – Trust in your skills, abilities and aptitudes. Know that you belong there no matter what anyone says. A = Attitude – Have you ever heard of the law of attraction? It means what you put out into the world will come back to you tenfold. A positive attitude can go a long way. I’m not saying everyday will be rainbows and sunshine (it won’t), but having a positive outlook will help you weather the storms. T = Tenacity – Keep going, no matter what! Have persistence and determination to reach your goals and enlist help when you need it. E = Exalt your success no matter how big or small. Don’t be afraid to take credit and accept praise when you’ve done great work! Don’t minimize your success. Be humble but not dismissive when others compliment you for a job well done. R = Resources – Know that there are always outside resources available for the sole purpose of supporting you, and that it is okay to approach others for help. While these are individual behaviors, thoughts, and attitudes that you can exhibit to overcome the “chilly” climate, it is important to recognize that larger systems are at play. We have much work to do as a society and a community to provide a supportive and enriching environment for women entering STEM fields. As a whole, we need to continue work towards dismantling systems of oppression that marginalize people and challenge cultural attitudes associated with racism, sexism, and patriarchy in all aspects of society – not just STEM. Antecol, H., & Cobb-Clark, D. (2001). Men, women, and sexual harassment in the U.S. military. Gender Issues, 19, 3-18. Ong, M. (2005). Body projects of young women of color in physics: Intersections of gender, race, and science. Social Problems, 52(4), 593–617. Willness, C. R., Steel, P., & Lee, K. (2007). A meta-analysis of the antecedents and consequences of workplace sexual harassment. Personnel Psychology, 60, 127-247.